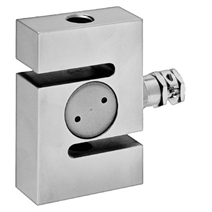 Tension/compression force transducers are designed for static and dynamic measurement tasks in the direct flux of force. They determine the tension and compression forces in a wide scope of applications. Force transducers of this series are used in weighing technology as well as in countless industrial applications, where high accuracy, simple installation with force introduction via the two internal threads and a favorable price plays a decisive role. These tension/compression force transducers are splash water protected and function reliably even under difficult service conditions. In order to avoid overloading, it is advantageous to connect the load cell electrically during installation and to monitor the measured value. The force to be measured must be applied concentrically and free of transverse force. The force transducers are to be mounted on a level surface.